The Chartered College of Teaching is an independent professional membership body for the teaching profession. The aim of the Chartered College is to support teachers in delivering the best education possible. It launches its founding members’ scheme today. The Chartered College has the potential to raise the status of the profession and put it on a par with law, accountancy, and the numerous other professions with chartered representation. It will combine teacher-led professional standards, a single code of ethics, a platform for knowledge and a commitment to continuous professional development that will underpin the professionalisation of teaching. 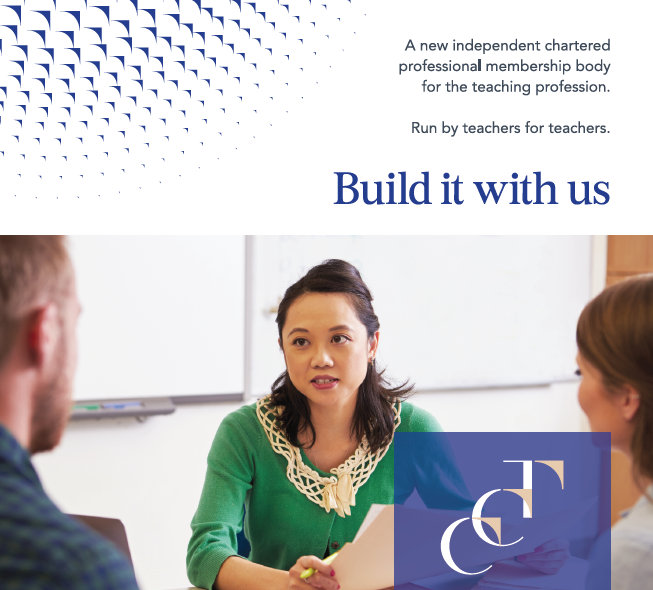 Run by teachers for teachers, it is an organisation that works in partnership with all associations, unions and learned societies to build on the best of teaching, combining this with existing and emerging research evidence. The Chartered College will speak with authority based on evidence about professional issues related to inclusive teaching, curriculum and assessment. Covering all phases of education and subject specialisms, the Chartered College will connect a diverse community of teachers to share ideas and knowledge and provide an independent, authoritative voice for the teaching profession. Membership is voluntary and offers a pathway of professional development to support teachers at every stage throughout their career. The information above has been taken, with a few minor adaptations from an information pack sent to Chartered College of Teachers’ advocates. More information is available here. The formation of a professional body for teachers is one step in us collectively reclaiming our professionalism. It’s no wonder Headteachers’ Roundtable has been supportive from the start; going further by suggesting compulsory membership. The power and influence of the Chartered College will partly be based on us all joining and supporting its work. At £39 for the year or 75p a week it’s money well spent. Please click to RT and show your support for the Chartered College of Teaching. Thanks. The appointment of Dame Alison Peacock as the first CEO of the Chartered College of Teaching is inspired; I wish her and the organisation every success in the years ahead. Their success will also be our success as a profession; together we’ll grow and flourish. I was not aware that I or any of my colleagues had “lost their professionalism” and resent any implication that this is the case. This has been imposed on teachers before and the suggestion that membership should be compulsory makes me very angry and disappointed that yet again our professionalism is yet again being undermined. Hello Diane, I’d just like to say that the Chartered College is not compulsory nor is it about undermining professionalism – far from it – and it is unfortunate that the report quoted above appears to suggest that it should be. In fact, the Chartered College is seeking to celebrate the excellent work that teachers do and aims to support teachers in raising the status of their profession but it’s entirely voluntary. It is a genuinely teacher-led organisation dedicated to creating a collaborative professional community and I’m heartened by the College’s intention that teachers will set their own professional standards rather than continue to have them imposed by policymakers. As you rightly say, teachers have not lost their professionalism but, in my opinion, the Media and policymakers have often undermined teachers’ professional standing. If the Chartered College can become a voice for the profession then teachers will have a better chance of their status as professionals being respected and valued.